Do you use a lot of hot-dip and electrolytically galvanized sheet materials? 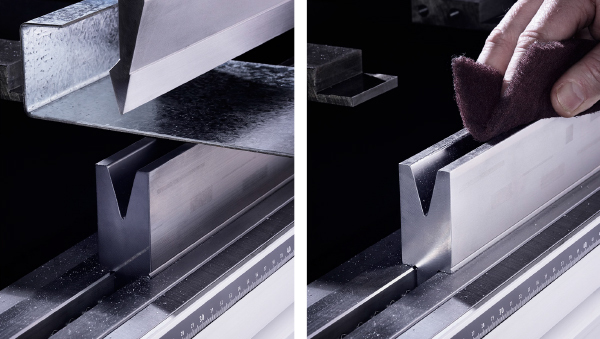 Do you want maximum productivity without having to continuously remove tools to clean them? Then OZU-ZN is the solution that you have been waiting for! Operators often have to clean tools after around 10 runs. So much zinc has sometimes collected on the bending radii that the sheet becomes trapped. And performing cleaning activities instead of bending, results in lost time and productivity. Furthermore, loading is also likely to damage the sheet material. The OZU-ZN Coating is a specially developed coating, which can be applied to all WILA CNC-Deephardened® Dies. This protective layer prevents zinc from depositing on the bending radii. Cleaning activities, which are a hinderance to productivity are a thing of the past. Some OZU-ZN users have reported production runs of up to 100,000 parts with a single die, without having to stop to clean them. This means a lot less down time and a significant increase in productivity. In such cases, WILA OZU-ZN can certainly prove its effective properties in a short space of time. No zinc deposits on bending radii. Die cleaning will be a thing of the past. No lost time, thus providing greater productivity. Considerably less chance of sheet damage. Longer tool life for dies. Sheet will no longer become trapped in dies with acute angle V-openings; a huge benefit during robotic bending operations. If you are interested in the WILA OZU-ZN coating and would like more information, please contact us by phone at 443-459-5496 or by completing the contact form.